Venus, the second rock from the sun, is often considered Earth's twin since it's similar in size and mass. The similarity ends there. 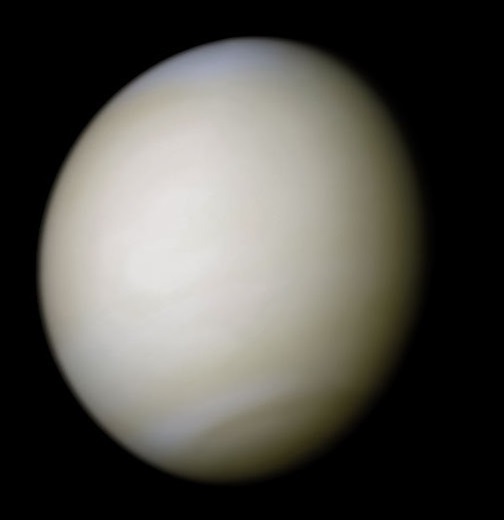 A day on Venus is almost four months long and if you could stand on the molten hot surface and see through the sulphuric acid clouds the sun would rise in the west and set in the east, it actually rotates in the opposite direction of all the other planets. Why is still a scientific mystery. A view in visible light of the clouded surface from the Mariner 10 flyby showing subtle bands in the thick atmosphere. 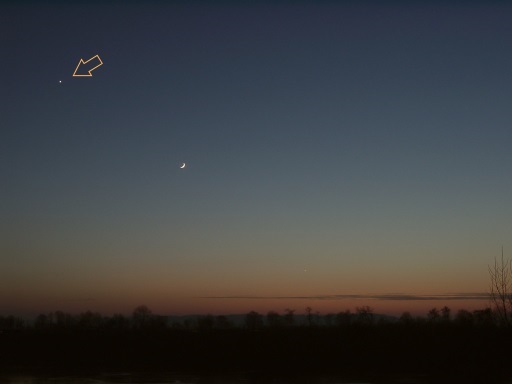 Venus has been visible since the begining of time to the unaided eye as a bright star near the horizon just after sunset and just before sunrise.